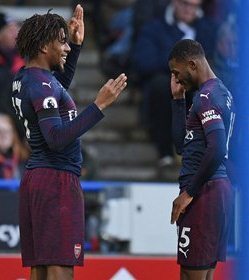 Alex Iwobi has expressed his pleasure at the goal scored by teammate Alexandre Lacazette in Arsenal's 2-1 win over Huddersfield Town at the John Smith's Stadium on Saturday. Iwobi scored the Gunners' first goal of the game with a deflected strike, his fourth of the season in all tournaments, before Lacazette made victory certain. Iwobi spoke to the club's website, www.arsenal.com following the crucial victory. "We've been working a lot on transitioning when we get the ball, to counter-attack and attack with speed. "So when the goal went in it was a great team move and I was also happy for Laca to get the goal as well," the Nigerian told the club's website. "Ainsley did well today,. He's an attacking threat. You can see that he can get up and down, he's got a lot of stamina. It'll do him a lot of good and hopefully he continues this run of form." "As soon as I saw it (ball) coming in the air and saw the defender coming, I thought I just had to get a good connection, and luckily for me it went through the guy's leg with a bit of a deflection and went in. "No, [this nutmeg] wasn't on purpose, I promise," the amiable winger stressed.